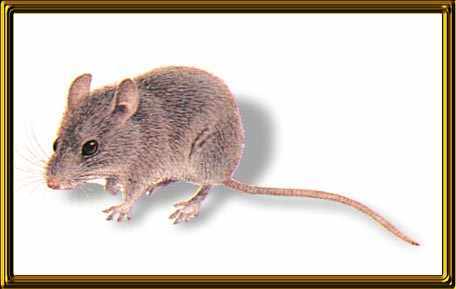 The house mouse came originally from south western Asia from whence it has spread all over the earth, mainly with the help of man. It has the amazing ability to adapt and it now occurs more or less where man has settled. In most cases the mouse is associated with buildings, often moving outside in the summer, but always retreating indoors come the autumn. In buildings mice will live anywhere and they are very difficult to keep out. If you can push a Biro (about 7mm) under a door then a mouse can get in...!! Mice are also totally omnivorous, in other words they will eat anything, even down to the soap in the bathroom or the candles you keep under the sink in case of a power cut, but their favourite foods are cereals and cereal products. For their size, they don't eat much but the damage that they can do, both with gnawing and soiling products with their urine and droppings is tremendous. 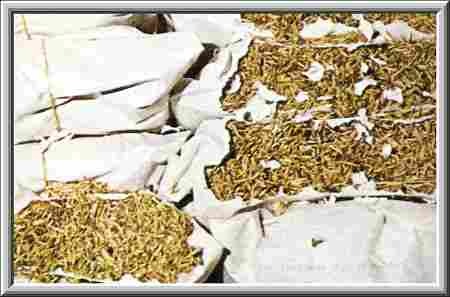 The picture below shows major damage in a seed store. They eat about 3 grams a day..not a lot..!! These guys don't need laxatives, they do about 80 droppings per day...WOW..!! Again, lady mice are pregnant for 3 weeks (Gestation Period). Madam can have between 4 to 16 in a litter, depends on food availability etc. She also can have 7 to 8 litters per year, some have been known to have 10. Sexual maturity of the young is about 8 to 12 weeks and then they are off again. Mortality rate is again approximately 90%. And a good job too..! How do we know that we have a problem, you may laugh, but lots of people have mice or rats, and don't even know it. Finding droppings in your cupboards etc. As you can see from above, if they have been there for any length of time then there will be quite a few. Smell, distasteful as this may be to some people, an infestation of rodents in say your roof space will be accompanied by quite a strong urine smell, especially if they've been there for some time. Damage, in the form of chewed articles in your cupboards, chewed insulation on the wiring in your roof space, this latter one can be quite dangerous as it can be a fire risk. Really rodents will chew anything because their top and bottom incisor teeth grow like our finger nails do. Consequently rodents chew to wear them back to the correct length, otherwise they would eventually starve to death. If there is a problem in your garden with rats, this will show up as runs along the edges through the vegetation, as rats usually use the same pathways. If you find a hole and there is a build up of grease around it, this is known as a smear mark. Just as we have grease on our hair so do rodents and continual passage through the same hole will cause a build up. Tracks are also an indicator, but a certain amount of expertise is required to fully interpret any findings. Great White Hunters us chaps you know..!! Last of all is seeing actual live rodents. This when the husband stands on a chair and waits for the wife to come home from the office, or something like that. OK!! so what can we do to help prevent our homes and businesses from being over-run with our furry friends? Have a walk around the outside of your house and look for any holes around pipe work, door frames, window frames, also any air bricks which may be damaged but never block these up totally as air in the foundations helps prevent dry rot. If you live in the type of house that is found in the Lake District, i.e. the type built with dry walling or slate, then the solution is a bit more difficult as filling all the holes with mortar would be very time consuming and could also detract from the general look of the building. In this case perimeter bait points might have to be considered. These have to be secure so they would need to be fitted by a reputable company who would maintain them as well. You could also call somebody who works for a professional company. This is not as expensive as you might think, and will give complete cover 24 hours a day and seven days a week as someone is always on call. You can take out a contract for so many visits per year or just pay for one or two treatments, whatever it takes. You can email me, PiedPiper and I will answer any queries you may have. If I don't know, then I will jolly well find out. C.O.S.H.H. (Control Of Substances Hazardous to Health). The Food and Environment Protection Act. Pretty heavy eh! all that above means watch it..! If the problem isn't too bad, then just use the good old mouse trap, but set it correctly this means at right angles to a wall/floor junction and not lengthways to it. If you are going to set a break back rat trap, then watch your fingers, if it goes off and they are in the way, it could break one or two of them. N.B. Contrary to popular belief, mice are not overly fond of cheese, however, a bit of chocolate or bacon rind works wonders. Don't go asking pest controllers for poisons, they can't give them to you, it is a sackable offence, and really, how the heck do they know what you are going to do with the stuff. Lyme disease is a bacterial infection that is spread to humans by infected ticks. Ticks are tiny, spider-like insects found in woodland areas that feed on the blood of mammals, including humans. Tick bites often go unnoticed and the tick can remain feeding for several days before dropping off. The longer the tick is in place, the higher the risk of it passing on the infection. Lyme disease is caused by the Borrelia burgdorferi bacteria. The bacteria are present in the digestive systems of many different animals including mice, deer, pheasants and blackbirds. If a tick bites an animal that has the bacteria, the tick can also become infected with it. The tick can transfer the bacteria to a human by biting them and feeding on their blood. Ticks are very small and their bites are not painful, so you may not realise that you have one attached to your skin. However, there is a higher risk that you will become infected if the tick remains attached to your skin for more than 36 hours. Once infected, the bacteria moves slowly through your skin and into your blood and lymphatic system. The lymphatic system helps fight infection and is made up of a series of vessels (channels) and glands (lymph nodes). Left untreated, the bacteria that causes Lyme disease can damage the joints and the nervous system, leading to symptoms of mid- and late-stage Lyme disease. The earliest and most common symptom of Lyme disease is a pink or red circular rash that develops around the area of the bite, three to 30 days after someone is bitten. The rash is often described as looking like a bull’s-eye on a dart board. You may also experience flu-like symptoms, such as tiredness, headaches and muscle or joint pain. Lyme disease in its late stages can trigger symptoms similar to those of fibromyalgia or chronic fatigue syndrome. This is known as chronic Lyme disease. More research into this form of Lyme disease is needed. Unless in its early stages when a rash is present, diagnosing Lyme disease is often difficult as many of the symptoms are similar to those of other conditions. Blood tests are useful and important in acute infection but don't always confirm diagnosis. The symptoms of early stage Lyme disease develop three to 30 days after someone is bitten by an infected tick. The most common symptom of early stage Lyme disease is a distinctive circular skin rash, known as erythema migrans. The size of the rash can range from between 2cm-30cm (0.7-12 inches) and in most people it expands over a period of several days or weeks. In up to a third of people with Lyme disease, the rash may be the only symptom. The symptoms of mid-stage Lyme disease usually develop many weeks, or sometimes several months, after being bitten by an infected tick. However, they usually only affect people who were not treated with antibiotics at an early stage of the disease. In untreated cases of Lyme disease, people will develop flu-like symptoms, such as aching muscles and tiredness. Some people may also experience two or three episodes of inflammatory arthritis (swelling and pain in the joints), which lasts for about a week. However, symptoms such as joint pain should eventually resolve by themselves, even if they are left untreated. Seek immediate medical advice if you experience any of these symptoms. Diagnosed cases of Lyme disease can be treated with antibiotics. Your course of antibiotics will depend on the stage at which your Lyme disease is at, but you will usually need to take them for two to four weeks. The Health Protection Agency (HPA) estimates that there are 2,000 to 3,000 cases of Lyme disease in England and Wales each year, and that about 15%-20% of cases occur while people are abroad. Most tick bites occur in late spring, early summer and during the autumn because these are the times of year when most people take part in outdoor activities, such as hiking and camping. There is currently no vaccine to prevent Lyme disease. In 2002, a vaccine was introduced in America but it was later withdrawn due to concerns over side effects.